Formulation: Liquid. PBS, pH 7.2, containing 4% formaldehyde and 0.1% saponin. Application Notes: Intended for use in simultaneously fixing and permeabilizing cells in one step to facilitate immunostaining and subsequent analysis of intracellular proteins using flow cytometry. This buffer can be used as an alternative to a two step process with fixation buffer (Prod. No. ADI-950-011) followed by permeabilization buffer (Prod. No. ADI-950-012). 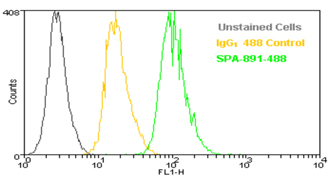 Flow cytometry analysis of 106 Jurkat cells were stained using PDI mAb (1D3), DyLight™ 488 Conjugate using one step Fixation/Permeabilization Buffer.